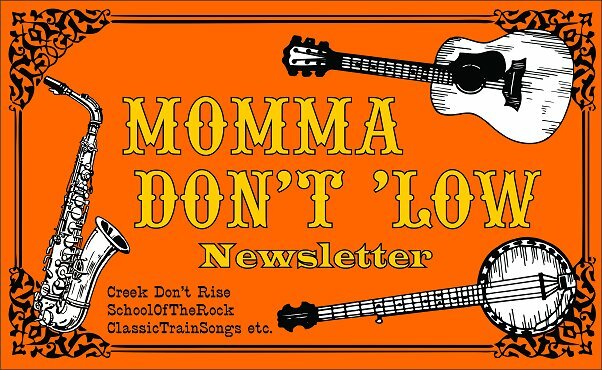 For more information on the newsletter, please see the Mama Don't 'Low home page. We want to hear from you. We want to share with you. We want to answer your questions. We want to send you any freebies that I've mentioned on any of our web pages. We really want you to join our community of like-minded people. E-Mail Questions - If you have a question AND you want to sign up for the newsletter, please use the form on this page (after reading the caveats). On the other hand if you JUST have a question and are not interested in receiving my newsletter, please use our Contact page. Why do I have two separate pages? 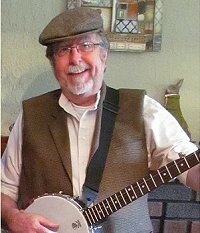 You would be amazed how many people who contact me with a question about one of the topics we discuss (say, 6-string banjos) sign up for the newsletter, then freak out when they get a newsletter that mostly talks about something different (say, zither banjos). This way we hope to avoid accidental signups and the resulting confusion. No Phone Calls, Please - Please don't call our house or call me on my cell phone unless you've already contacted me through this form or the Contact page and told me what you want to talk about. That way I can be prepared to take your call, and we can be sure that we're respecting each other's time and priorities. Don't think this is silly; I've had readers with "emergencies" call me when I'm eating dinner, in bed, and even on stage. Even if I take the call at such times, I may not have the resources handy to answer your questions. What To Expect if You Fill Out This Form - [Paul Race speaking] By signing up here, you are signed up for my newsletter, which basically covers my ongoing projects, including updates about acoustic instruments I'm researching or working on and news about my music "career" (such as it is). I mention this because some folks have signed up to hear about places I'm going to play or songs I'm working on, but unsubscribed angrily because the first issue they received had mostly links to autoharp articles or whatever. Other folks have signed up to get information about dulcimers, say, and have unsubscribed angrily because the first issue they got included information about places I'm playing or songs I've written, and didn't have any dulcimers articles that issue. But the next issue might be entirely different. Just warning you ahead of time. Related directions about traditional musical forms and instruments, especially as reader questions or puzzles pique my own interest. If this sounds good, I WANT you along. But I only want you along for the journey IF all that sounds good to you. Hope that makes sense. The most recent newsletter, and the first full newsletter after my "reboot" in which I relegated articles about vintage saxophones and Christian music to a separate newsletters, is here. I hope you enjoy it, but if you don't, just let me know. Also, if there's anything specific you'd like more coverage of, just let me know. I'm not saying I'll jump right on it, but if it's something I already have on the back burner I may move it to the front burner. I hope you can understand why I'd rather spend my time interacting with 40 people who are really interested in what we do than waste it sending out 4000 e-mails to people who aren't really interested in what we do or, in some cases, aren't even real people. Not to mention wasting time "vetting" requests that are incomplete or unconvincing. Consequently, any form that is missing required fields or which contains obviously fake information will be deleted automatically, with no warning to the sender. And the way the form is set up, it is possible to send an incomplete form (this catches some robospammers). So be certain to check your form over before you submit it. Finally, we'd like to know more about our reader base, too. So if you don't mind filling in a little survey (entirely optional), that will help us figure out what kinds of articles we should be working on next. Would you like to receive (by US Mail) any mailings we produce? (This almost never happens but we're asking just in case). We count on reader feedback to help us plan our site improvements. Could you please answer the following questions to let us know what you've found useful or would like to see more of? To help us plan articles (and in some cases events), please let us know that aspects of music and/or theatre you are currently involved in. Nobody will see this but us, but we find this information very helpful. Also, if you have a web page that is related to the content of this site, or you're involved with an organization that has a web page, please post the link(s) in the comment area, in case we have an opportunity to point readers to your site for specific information. And just for fun, please let us know any instruments you play. (Optional.) Nobody will see this but us. Also, if you feel like something needs more clarification, just put the additional details in the "Others" area below this list. If we get a number of folks listing the same instrument that we don't call out individually in this list, we may add it. To return to the CreekDontRise.com™ Home Page, click here. To return to the ClassicTrainSongs.com™ site, click here. To return to the RiverboatMusic.com™ site, click here. To return to PaulRaceMusic.com, click here. Whatever else you get out of our pages, I hope you come away with some great ideas for "sharing the joy." 2007, 2008, 2009, 2010, 2011, 2012, 2013, 2014, 2015, 2016, 2017, 2018 by Paul D. Race. All rights reserved. For questions, comments, suggestions, trouble reports, etc. about this page or this site, please contact us.